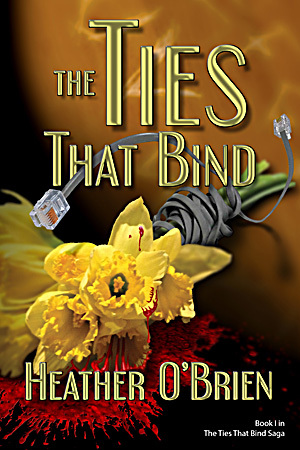 The Ties That Bind ~ explores the complex lives of the O’Conners, the Grants, and the Lockhardts. Something-or someone-ties these three families together. Farin O’Conner is a beautiful 25 year old singer making the jump from the Los Angeles nightclub scene onto the Top 40 charts. She has been signed by Warner Brothers Records and, due to a fateful meeting at a swank LA restaurant, is dating pop music’s biggest sensation: Jordan Grant. Outwardly, Farin has it all. Inwardly, a storm is brewing. This storm threatens to consume her and bring anyone in her path to ruin. Only those closest to her know about the nightmares, her shaky personal relationships, and the emotional instability that began shortly after the tragic and mysterious death of her father fifteen years earlier. Along the road to fame and fortune, Farin’s past and present collide in a miasma of secrets and scandals. Jordan Grant becomes the love and stability for which Farin has always longed. He ignores her inconsistencies, endures her extremes, and vows to exorcise the ghosts of her past. His only flaw is his inability to face the truth: Farin is a dam on the verge of breaking. Chris Grant, a rock-n-roll icon and Jordan’s older brother, is the one person who threatens Farin’s relationship with Jordan. Chris has spent his entire professional life enjoying his celebrity and all that accompanied it. But when Chris meets Farin, feelings assail him he can scarcely label, let alone resolve. If he pursues Farin, his life will change forever. That change will include the end of his career as well as the disintegration of his already troubled relationship with his family. Record mogul Jameson Lockhardt is the world’s most successful creator of musical megastars. He holds recording contracts with Jordan, Chris and, eventually, Farin. Unbeknownst to anyone, he also holds many secrets—secrets that motivate him to change Farin’s name, destroy Chris’ career, and deny his only son a normal life. Jameson holds the keys to Farin’s past and present like a map to a hidden treasure…and he will stop at nothing to keep them buried within the sands of time.